I’m pleased to announce that I am part of a Mythgard Movie Club panel on Thursday night. A couple of years ago we hosted a “One Fantastic Rogue Beast” panel to let two popular films clash in conversation: Fantastic Beasts and Where to Find Them and Star Wars: Rogue One. I followed up with my thoughts on the new Harry Potter world film with a post called “Fantastic Beasts and Where to Put Them.” We decided to call the council once more to discuss the new Fantastic Beasts film, The Crimes of Grindelwald. Join the Mythgard Movie Club on December 13, 2018, for a discussion of Fantastic Beasts: The Crimes of Grindelwald, directed by David Yates and starring Eddie Redmayne. 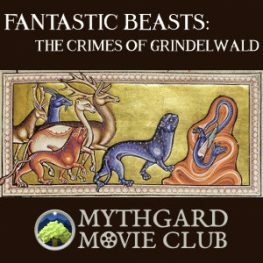 Join the Mythgard Movie Club on December 13, 2018, for a discussion on Fantastic Beasts: The Crimes of Grindelwald, directed by David Yates and starring Eddie Redmayne. Based on a script written by J. K. Rowling, Grindelwald is the follow-up to Fantastic Beasts and Where to Find Them (2016), and it is the second in a series of at least three films set in the world of Harry Potter and following the adventures of magizoologist Newt Scamander. In the prior film, Newt helped the Magical Congress of the United States of America (MACUSA) catch a dark wizard named Gellert Grindelwald. However, at the end of the film, Grindelwald escaped. Now, he is raising an army of like-minded wizards and witches to assert magical rule over all non-magical people. In this film, Scamander teams up with a young Albus Dumbledore (played by Jude Law) in an attempt to recapture Grindelwald and put an end to his evil plans. For this discussion, we are bringing back some of the original team of panelists that joined our the proto-Movie Club discussion One Fantastic Rogue Beast in January 2017. Fantastic Beasts: Crimes of the Grindelwald premieres in theaters on November 16, 2018 – which gives everyone about a month to see the film before our discussion on it! Kelly Orazi is a longtime bookseller, reader, and Signum Grad Schoolstudent. She spends her days reading Harry Potter, pretending she has the Force, and hanging out with her dog, Lupin. She is descended from a real-life wandmaker, but has yet to embark on the journey of making her own lightsaber. Emily Strand is a professor of Comparative Religions at Mt. Carmel College of Nursing in Columbus, OH, where she also serves the Catholic diocese as a Master Catechist. Besides her books on liturgy, she has published articles on the Harry Potter series, including a contribution to Harry Potter for Nerds 2, and many essays at HogwartsProfessor.com. She has appeared on the Mugglenet Academia podcast and is a frequent guest on the Reading Writing Rowling podcast. Brenton Dickieson is working on a PhD on the theology of C.S. Lewis’ fictional worlds and writes the blog, http://www.aPilgrimInNarnia.com. He lives in the almost fictional land of Prince Edward Island, where he teaches and consults in higher education. Curtis Weyant is a Signum Grad School alumnus whose daughter tried to teach him the magic spells at The Wizarding World of Harry Potter in Orlando, but never quite got the hang of it. A digital marketer by trade, he co-hosts the weekly podcast Kat & Curt’s TV Re-View and occasionally pecks away at his own creative work. This entry was posted in News & Links and tagged Fantastic Beasts and Where to Find Them, Fantastic Beasts: The Crimes of Grindelwald, Harry Potter, J.K. Rowling, Jude Law, Mythgard Academy, Signum University, The Crimes of Grindelwald. Bookmark the permalink. Thanks David. Kind of a funny video! How’d it go? – enjoyably I confidently expect! I don’t see a video of it on the YouTube Signum University channel yet, but suppose we may hope for one? A lot of fun! I’ll post on Friday.